På Camping Pilsensee i Seefeld (Bayern) camperer du allerede for €20,- per nat i lavsæsonen med CampingCard ACSI. På en af de 140 åbne pladser opholder du dig under 01-01-2019 - 12-04-2019, 28-04-2019 - 30-04-2019, 03-05-2019 - 29-05-2019, 02-06-2019 - 07-06-2019 og 01-09-2019 - 31-12-2019 med rabat. På denne campingplads kan du, udover fordelagtig campering med dit CampingCard ACSI, også bruge dit ACSI Club ID (stedfortrædende identitet). Skovrig campingplads lige ved det smukke Pilsensee, hvor der er mange vandsportsmuligheder (paddle boards, bådudlejning, fiske, surfe). Ny anlagt anløbsbroer og stor børnelegeplads. Restaurant med ølhave ved vandet. Sporvognsrute til porten i München. Good position on pretty lakeside. Very large pitches. Convenient for Munich. Main problem is with new shower block - only opened for two weeks when we were there, Whilst fittings superb the design is the most ridiculous I have ever seen as it is completely impossible to dry/dress in private. Only solution would be to fit doors to each cubicle - not considered we were told. Additionally the showers are cleaned/closed at 0700 daily - the time that many people want to use them! We stayed on this site in our campervan in June 2016. It had rained quite a lot and the grass pitches were very wet. The grass did not appear to have been cut for a long time. We chose this site because of the good links into Munich. The S Bahn was a good 20 minute walk from the camp site, but was a direct 45 minute train ride to the centre of Munich. On a plus side it is the first time we have come across dishwashers readily available for campers. No discount for people with tents. That is what we where told at the reception by the not so friendly staff. The small store was stocked like it was 1936...not much of anything but the absolute basics. The showers and toilets where clean. The restaurant at the site was nice but we did not eat only had a drink there. 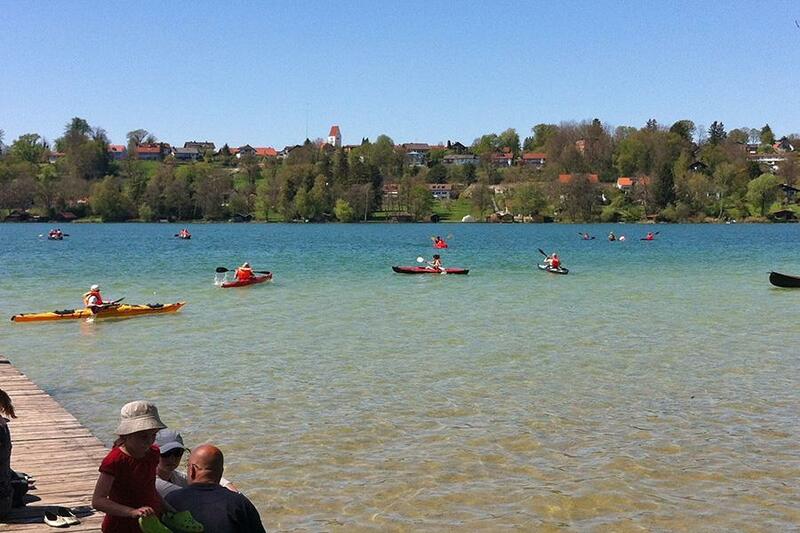 Vil du booke Camping Pilsensee eller have yderligere information? Det kan du via nedenstående oplysninger eller via campingpladsens hjemmeside. Forlad syd for Seefeld den statslige hovedvej 2068 Oberpfaffenhofen-Hersching. CampingCard ACSI sender din forespørgsel videre til "Camping Pilsensee".